In the years following the establishment of the Defence Forces, various classes of Army Reserves were experimented with between 1927 and 1939. 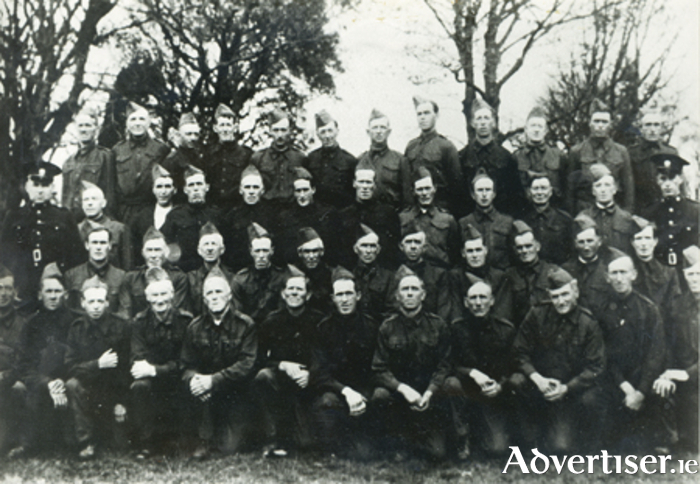 In May 1927, a Class A Reserve was formed consisting of NCOs and men transferred to the Reserve. In January 1928, a Class B Reserve was set up with the object of building up the infantry arm of the Defence Forces. One joined voluntarily, but in doing so, committed to three months initial training and one month’s annual training thereafter. This group had practically ceased to exist by 1934. The Volunteer Reserve Force was established in the autumn of 1929. No initial training was required but one had to attend parade once weekly, spend four weekends on camp per annum, and commit to 15 days’ annual training. This group disbanded in 1935. In March 1934, the Volunteer Force was formed. Fianna Fáil had come to power in 1932 and were anxious that the army should be more representative of the different political persuasions. Since 1924 the army was made up of pro-Treaty supporters, and Fianna Fáil were hoping more people of the other persuasion would join, so they commissioned a number of anti-Treaty personnel in the early stages. In November 1936, the ‘Regiment of Pearse’ was established consisting of three lines of reserve with varying conditions of service. The first line to undergo initial training and a commitment of 30 days annual training; the second line were personnel who had been trained transferred; the third line were intended as a reserve of specialists in civilian life who would be of value to the army on mobilisation. Our photograph today (for which we thank Mrs Breda Murphy of Bohermore ) shows the Claregalway Local Defence Force Unit, 1935. In the front row are Johnny Kearney, Knockdoe; Stephen O’Brien, Waterdale; Martin Murphy, Tona Cnoic; Val Duggan, Na Coila; John O’Keane, Caraun; Peter Ford, Cahergowan; Willie Duggan (Cosula ), Summerfield; Henry Duggan (Seán ), Mointeach; Seán Coen (Johnny ), Cahergowan; Martin Hughes, Claregalway; Tom Moran, Tona Cnoic; Malachy Moran (Stephen ), Cloonbiggeen. Second row: Mick Lenihan, Lakeview; Seán Lynskey, Clogher; Val Duggan (Bailiff ); Pat Skerritt, Mullacutra; Tim Feeney, Mullacutra; George Glynn, Lydican; John Egan, Kiltrogue; Dan Harney, Claregalway; Billy Morris, Cregboy; Martin Fox, Carnmore; Michael Madden (postman ). Third row: Sergeant Gillespie, Loughgeorge; Dan Duggan, Mointeach; Charlie Quinn, Cregboy; Paddy Carr, Cregboy; Patrick Canavan, Waterdale; James Collins, Waterdale; Johnny Flaherty, Cahergowan; Jimmy Connell, Cloonbigeen; Sonny Giles, Lydican; Séamus Greally, Cloonbiggeen; Martin Hanley, Claregalway (dancehall ); Garda Lynch, Loughgeorge. Fourth row: Pat Wall, Cahergowan; Bailiff McGrath, Cregmore; Darby Greally, Gortcloonmore; John Long, Kiniska; Joe Long, Kiniska; James Hession, Claregalway (pub ); Paddy Moran, Lakeview; John Concannon, Mointeach; Paddy Moran, Cloon (Mártín ); Michael Skerritt, Claregalway (carpenter ); Dan Noone, Cahergowan; and Seán Greally, Mointeach (Diarmuid ). The Old Galway Society’s annual John Monaghan Memorial Lecture will take place this evening in the Victoria Hotel at 8pm. It will be given by Brendan McGowan of the City Museum and the subject is “A Galway Icon, the Statue of Pádraic Ó Conaire”. All are welcome. On Monday next, March 13, Michael Gibbons will deliver the Galway Archaeological and Historical Society’s lecture on the topic of “Drowned Landscapes of the Galway Coast, Stone Boats, Subsea Roads and Ambergris”. It will start at 8pm in the Harbour Hotel and all are invited.